Over the last 7 days, the Greater New York Red Cross provided emergency assistance to 65 adults and 36 children following 33 local disasters. Here are some highlights from last week and a preview of upcoming activities (see below). Early Sunday morning, the Red Cross responded to a massive 2-alarm fire in Harlem that sent many residents and firefighters to the hospital. The Red Cross was on hand to provide emergency support to affected residents. Red Cross volunteers throughout the region proved their commitment to training by taking part in a shelter fundamentals exercise on Sunday that was hosted by the Metro New York North Chapter in Hawthorne, N.Y.
On Thursday, the Red Cross picked up the second round of chairs donated by the Javits Center. 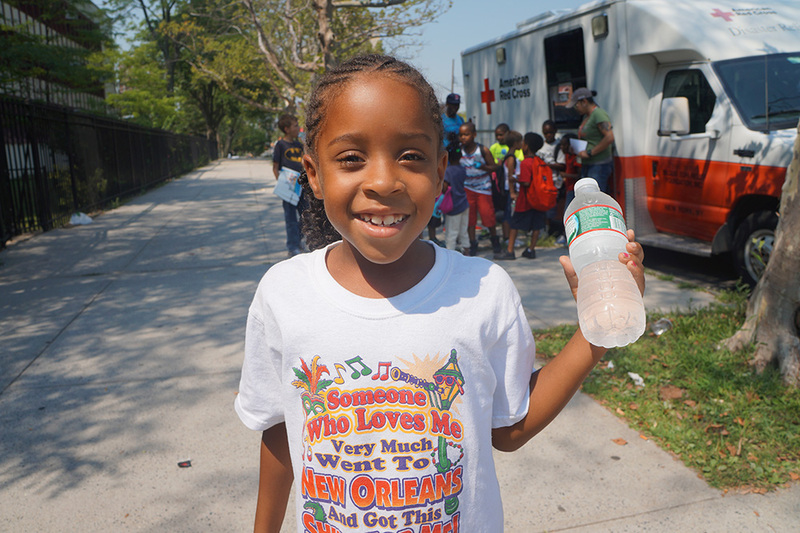 The Red Cross posted a recap of an event on Monday that was held in partnership with the FDNY to help prepare kids in the Bronx for emergencies. On Monday, the Staten Island Advance promoted an upcoming Pillowcase Project event on August 29 hosted by Assemblywoman Malliotakis. The Pillowcase Project teaches children emergency preparednes. Early last week, it was reported that CNN anchor and a presenter at last year’s Red Cross Gala, Chris Cuomo, while boating in the Hamptons, rescued a drowning man who had been swept away by a riptide. Aug 26, 28: Red Cross blood drives; 1 to 7pm; 520 West 49th Street, Manhattan. Schedule an appointment to donate today. Aug 27: NYC OEM will be kicking off Preparedness Month with a community fair at 165 Cadman Plaza East, Brooklyn NY 11201. The Red Cross will be on hand to distribute preparedness information. Aug 29: On Sunday, the Pillowcase Project, a Red Cross children’s preparedness program, takes center stage with presentations in Staten Island (New York City), Mineola (Long Island) and Jeffersonville (Metro New York North). Sep 9: The Voices of September 11 is holding a Resiliency Symposium for mental health professionals and researchers/clinicians in the fields of trauma/bereavement, as well as 9/11 families, responders and survivors. Sep 18 and 25: The American Red Cross, in partnership with the Manhattan VA, is offering two "Resume Writing and Job Skills Training" sessions to assist military veterans looking for employment. Both sessions will run from 12:00 PM to 2:00 PM. The sessions will be held at the VA Manhattan campus, the deadline to register is August 28.